One of UNB’s most committed and generous alumni has provided funding that looks to foster a better understanding about the roles and impact of the Canadian Army. Dr. Fredrik S. Eaton, O.C., O.Ont., former chancellor of UNB, and the Catherine and Fredrik Eaton Charitable Foundation have donated $1 million to establish the Fredrik S. Eaton Chair in Canadian Army Studies. The chair will be housed within the Brigadier Milton F. Gregg, VC, Centre for the Study of War and Society on UNB’s Fredericton campus. The chair, which will be held by the Deputy Director of the Gregg Centre, will build on the Centre’s internationally recognized undergraduate and graduate teaching, public outreach, scholarly publications, and its expertise in all aspects of modern conflict. The focus of the chair will be to connect citizens to the Canadian Forces and to further the professional development of the Canadian Army. 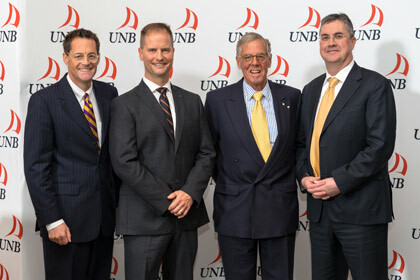 A UNB alumnus, Fredrik S. Eaton served as the university’s chancellor from 1993 to 2003. He is the former High Commissioner for Canada to the United Kingdom of Great Britain and Northern Ireland and the former chairman, president and CEO of the T. Eaton Co. An unfailing supporter of the university, Dr. Eaton received a bachelor of arts in 1962 and an honorary doctor of laws degree in 1983 from UNB. “UNB is proud of the role it plays in the broader Canadian community," said Dr. Eddy Campbell, UNB’s president and vice-chancellor. “This funding, from one of UNB's most esteemed friends and community members, will assist us in further advancing Canadian history, citizenship and our collective understanding of conflict and war." UNB is strongly positioned for research in this area having a 40 year partnership with the Combat Training Centre at CFB Gagetown and The Royal Canadian Regiment. The announcement was made during the annual convocation celebrations taking place at the University of New Brunswick.